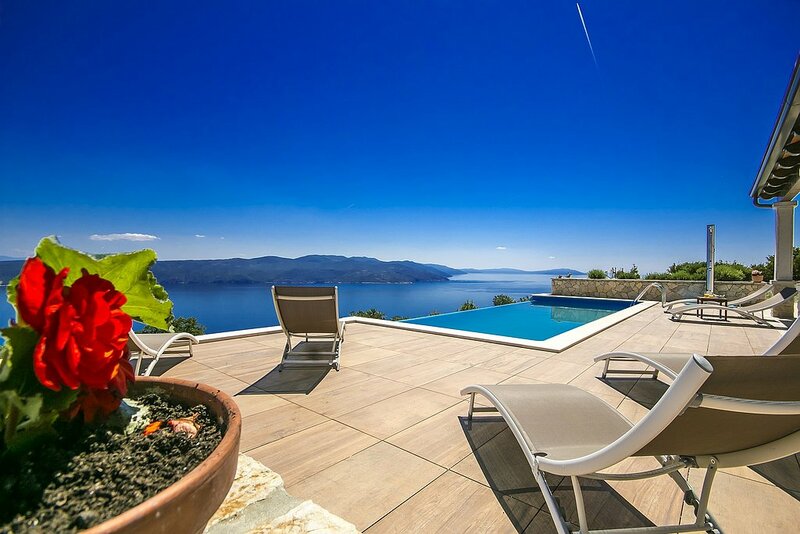 Villa Kalina is situated in the small village Zagore, halfway between the tourist pearl Opatija and Labin-Rabac area. The guests of this beautiful and modern holiday home will enjoy the exceptional views of the sea and the neighbouring islands. Near the house is the ferry port, ideal for those who want to visit the islands Cres and Losinj. The nearest shop and restaurant, as well as the beach, are in the village Brsec, only 2,5 km away. 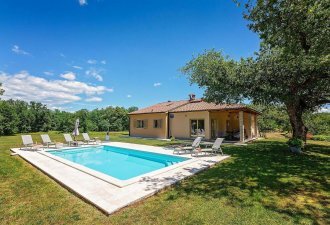 On an enclosed property of 1500 sqm there is an outdoor swimming pool of 24 sqm, covered terrace with barbecue and dining table, deckchairs, three parking spaces and a parking space in the garage. This spacious holiday home consists of three separate apartments of a total of 250 sqm. On the ground floor of the house is an apartment of 85 sqm with fully equipped kitchen and dining room, living room, two bedrooms, each with private shower/toilet and a separate toilet in the hallway. On the first floor is the second apartment of 85 sqm with fully equipped kitchen and dining room, living room with exit to the spacious balcony with beautiful sea view, two bedrooms, each with private bathroom and a separate toilet in the hallway. In the attic is the third apartment of 80 sqm with fully equipped kitchen, living room with dining room and exit to the balcony with beautiful sea view, two bedrooms and two shower/toilets.